Players of both varieties of the game will benefit from coaching by experienced coaches and our annual Introduction to Croquet course is run by them. 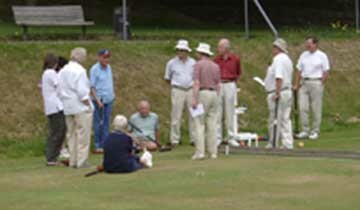 Coaching, including that for beginners, is normally available informally each Club Afternoon and we also run special Coaching Sessions, typically a course for Association Croquet Improvers and one day sessions for Golf Croquet. Coaching is also available on request. As we are a member of the South East Croquet Federation you will be able to benefit from reduced prices at their Croquet Academy, based at Southwick, which provides a wide variety of courses – mostly during each April and May.